And the winner is: up to you! Voting begins today for the coveted 2010 USEF Equestrian of the Year, which, following decades of tradition comes at the end of the 2010 competition year and is announced when the horse world meets at the United States Equestrian Federation’s annual Pegasus Awards celebration in January. Known as the USEF Equestrians of Honor, eight stars of equestrian sport—across breed and discipline—each recently received a unique competitive trophy. These honors will be presented during the celebrated Pegasus Awards on January 22 at the Downtown Hyatt Regency in Lexington. The William C. Steinkraus Trophy is presented to an equestrian competing in the Olympic disciplines of dressage, eventing or show jumping. McLain Ward and his superstar partner, Sapphire, dazzled the show jumping world in 2010 with grand prix victories around the world. From the $500,000 FTI Consulting Finale Grand Prix repeat win to the $1 million dollar prize at the Pfizer Grand Prix in Saugerties, NY, the duo continues to dominate the U.S. show jumping world. After rebounding from heartbreak at the 2010 Rolex FEI World Cup Final, they went on to win on the world stage from Rome to La Baule. Ward also scored a major victory in Dublin with Antares F.
The Becky Grand Hart Trophy is presented to an FEI international-level non-Olympic athlete. The only American WEG double-Gold medalist (aboard Gunners Special Nite) and NRHA $1 Million Dollar Rider, Tom McCutcheon continued to elevate America’s reining dominance in 2010. As Kentucky Cup Champion and Reserve Champion at the Adequan/USEF Open Reining Championships, he has left few titles to be won in a career that continues to thrill fans both at home and abroad. The Bill Robinson Trophy is presented to an equestrian competing with horses or ponies across all the breeds in harness or for driving performance in non-international competitions. For four decades, Nadine Tilley has been competing in open driving shows, combined driving events and traditional carriage driving, including International Andalusian/Lusitano Horse Association driving classes. Her honors in 2010 include four National Champion titles earned at the 2010 IALHA Nationals – Pleasure Driving Open, Pleasure Carriage Driving Amateur, Show Pleasure Driving Junior Horse and Half-Andalusian Driving Amateur. She also took the blue ribbon in the Pairs Working Open class at the Los Angeles County Fair, in addition to the Working Pairs Championship Stake title. The Emerson Burr Trophy is presented to a rider in the hunter divisions in any breed over fences. When it comes to hunters and championship titles, the name Hunt Tosh and the word “winner” were synonymous in 2010. Following a hugely successful 2009 competition year, Tosh made easy work of 2010, dominating the Working Hunter and Green Conformation classes spanning the East Coast. He added multiple Overall Circuit Champion titles to his roster of wins in addition to being named Champion at the USHJA International Hunter Derby Finals aboard Lone Star. The C.J. “June” Cronan Trophy is presented to those excelling in under saddle show breeds. One of only five riders ever to win the American Saddlebred’s Five-Gaited World’s Grand Championship title aboard three different horses, Merrill Murray was the rider and trainer of the 2010 Champion, Courageous Lord. It just so happens this was a repeat from 2009, where Courageous Lord was also crowned the Five-Gaited World’s Grand Champion. 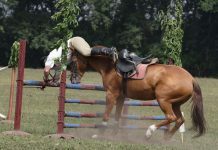 In 2010, Murray rode two different horses to the Champion Five-Gaited title at the Indianapolis Charity, Rock Creek, Lexington Junior League, Shelbyville Horse Show, All American Horse Show and the Kentucky State Fair. The Barbara Worth Oakford Trophy is presented to an equestrian showing in a non-reining Western discipline. If you competed against Daryl Hopson and any of his Western pleasure mounts in 2010, the chances are you lost. Hopson’s dominance was felt from show to show from the Key Classic in Washington to the regional championships in California and New England in addition to many others. His work was also rewarded at the Grand National and World Championships in Oklahoma City where he guided four separate horses to Grand National and World Championship honors. The Norman K. Dunn Trophy is presented to an equestrian competing at halter or in-hand. In a career spanning several decades, Michael Byatt has won titles worldwide. His success in the show ring is legendary. In 2010, his masterful presentation of some of the finest Arabian horses garnered multiple top titles in impressive competition at all the majors, including Scottsdale, Egyptian Event, U.S. Arabian & Half-Arabian National Championships, as well as international wins at Aachen, Menton, Sharjah and Paris. The Vaughan Smith Trophy is presented to the best rider of any horse or pony breed shown in hunter pleasure, show hack, hunter hack, dressage hack, costume, side saddle or Western dressage. On her way to the 2010 International Friesian Show Horse Association (IFSHA) World and Grand Nationals Horse Show, La Vine steadily outperformed her competition on the West Coast whether it was in English pleasure classes or show hack with her part-bred Friesians or Half-Andalusians. Her work culminated at the World and Grand Nationals where she was undefeated in every class in which she entered. She took home eight World and six National Championships, plus two high-point awards. 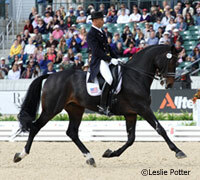 One of these eight award-winners will be honored as the overall 2010 USEF Equestrian of the Year. Now, it is up to you—USEF members, designated equestrian media and the USEF Board of Directors—to decide who will receive the top tribute for 2010. Simply visit usef.org and click on the Equestrian of the Year voting icon on the right side of the homepage and type in your USEF member number to access the voting portal. Voting will end at Midnight [ET] on Tuesday, January 11, 2011. For more information regarding the Equestrian of the Year program or any of the eight Equestrians of Honor, contact Trisha Watkins, USEF Awards Manager, at 859.225.6944 or tlwatkins@usef.org. Thanks for the list. Will be interesting to see who wins. As long as it’s not McLain Ward. No soring. Tom McCutcheon all the way!